Dress blue uniforms reflect America's national color and find their origin in the Revolutionary War. The history of dress blues in the military can find its roots in the Revolutionary War when then-Gen. George Washington commanded his revolutionary soldiers to be outfitted with blue uniform coats. The requirement for wearing national blue was reiterated in Army regulations in 1821 and blue remained the national color of the Army until 1902. Today, all branches of military service, the Marines, Navy, Army and Air Force, have their own variation of a dress blue uniform. Although each is distinct in appearance, they share common requirements for the placement of insignia and badges. 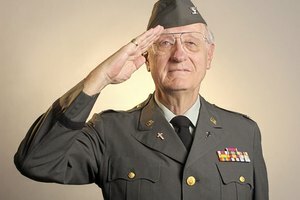 Military personnel are authorized to wear their dress blue uniforms at special functions such as military funerals, weddings, memorial services or inaugurations like that of the President of the United States. Dress blue uniforms may also be worn at patriotic parades on national holidays, like Memorial Day, or other military parades or ceremonies where active or Reserve military units are participating. Additional times where dress blue uniforms are appropriate include at educational institutions where you are responsible for giving military instructions or are in charge of military discipline or at social functions where your invitation was a result of your military participation. A requirement of military service dress blue uniforms is the wearing of a nameplate. The metallic nameplate should be placed on the right side of the uniform, centered between the sleeve seam and the lapel. The bottom of the nameplate should be parallel with the bottom of ribbons placed on the left side of the jacket. Depending on your rank and qualifications, there are a number of badges and insignia you can have on your service dress blue uniform. However, follow your specific military branch guidelines for proper placement. For example, on the Army service dress blue, officers should place the U.S. insignia pin 5/8 inch above the notch on both collars, with the centerline of the insignia bisecting the notch, parallel to the inside edge of the lapel. Enlisted personnel should place their U.S. pin 1 inch above the notch, centered on the right collar, with the centerline of the insignia parallel to the inside edge of the lapel. 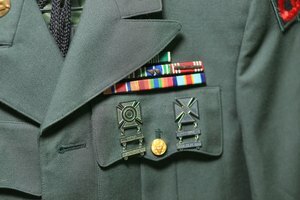 For all military personnel, shoulder insignia identifying rank should be sewn on jacket sleeves, centered between the shoulder seam and the elbow. 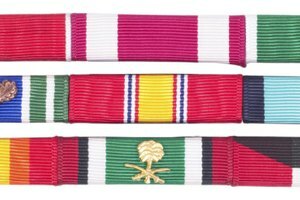 For Air Force personnel, you may have a maximum of four earned badges on your uniform, with a maximum of two of them as occupational badges. Badges should be located above the nameplate on the right side of the jacket. 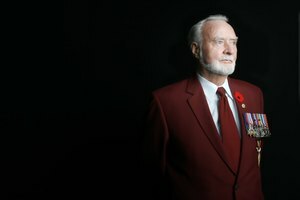 However, a maximum of two badges may be worn on the left side of the jacket above the ribbons or the pocket if no ribbons are worn. 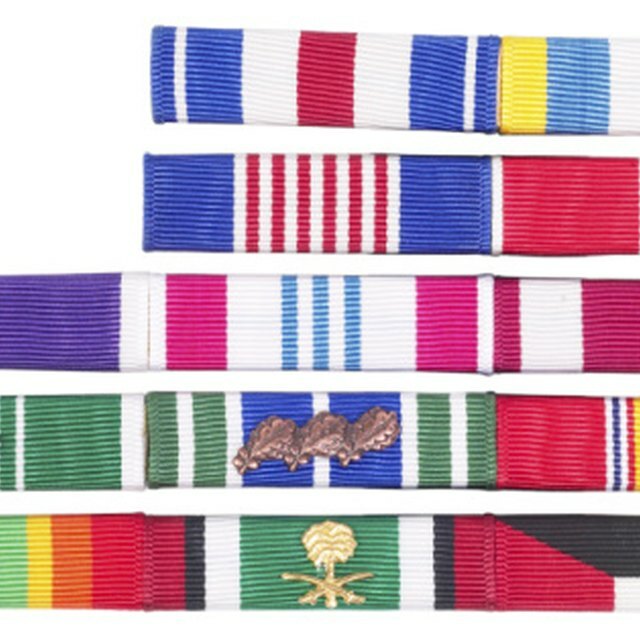 For all branches of military, when wearing ribbons or awards on your service dress blue uniform, wear the award with the highest precedence on the top row, nearest the lapel. For ribbons, wear no more than four devices in one row. Align the ribbons on the left side of the coat, above the pocket, so the bottom of the ribbon is parallel with the bottom of the nameplate on the right side of the coat. If necessary, the lapel may cover a portion of the ribbon. When wearing medals, do not mix sizes, either wear all miniature medals or full-size medals. 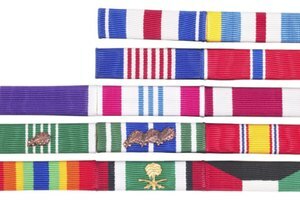 Arrange the medals so that the bottom row of medals are positioned parallel to the nameplate. Miniature medals are to be worn side by side, with no more than four in a row and they may overlap. If overlapping, the medal may not have more than 50 percent coverage of the medal next to it and the coverage must be equal for all medals. What Is the Proper Way to Wear a Tuxedo? Waldo, Danny. "Proper Placement of Insignia & Patches on a Dress Blue Uniform." Synonym, https://classroom.synonym.com/proper-placement-of-insignia-patches-on-a-dress-blue-uniform-13583682.html. 04 October 2017.